If you already use Virto SharePoint Workflow Activities Kit and need to upgrade it to the latest version, download the.zip file from http://www.virtosoftware.com. Unzip the file and run setup.exe as it is described in the Installing Virto SharePoint Workflow Activities Kit section. Check the box “Upgrade” and click “Next”. 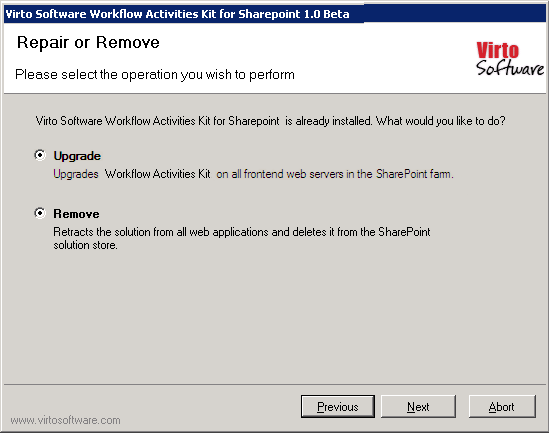 Note: if you had activated the license while installing the previous Virto SharePoint Workflow Activities Kit version, you do not need to activate it now.